Pictured second from left, CORAS winner Jenna Meeks, along with Southern Local Superintendent Tony Deem, Superintendent of Public Instruction Paola DeMaria and Dean of Education at Ohio University Dr. Renee Middleton. RACINE — A Southern High School (SHS) teacher recently received recognition from The Coalition of Rural Appalachian Schools (CORAS). Jenna Meeks, SHS Agricultural Instructor, was honored with the 2018 Outstanding Teacher Award distributed by CORAS on Jan. 24 at the Zanesville campus of Ohio University. CORAS has a 28 year tradition of advocating and supporting public schools across the Appalachian region of Ohio and recognizing outstanding teachers is a way to continue the tradition. Meeks shared this is her sixth year of being at SHS where she teaches agriculture to freshmen through senior year students and is also the Future Farmers of America (FFA) advisor. She said her classes include Agriculture, Food, and Natural Resources (AG 1), Structural Engineering (Shop 1), Forestry, Agriculture Business Management (Work Study), Livestock Selection, Nutrition and Management, and, Agriculture Capstone (Shop 2). Deem shared that Meeks is very active at the county fairs and has respect from her students as she provides tremendous opportunities for her students to grow and succeed. Meeks shared it was a great pleasure for her to be among such outstanding educators at the awards reception. She said she was surprised, flattered, humbled, and honored to receive the 2018 Outstanding Teacher Award. 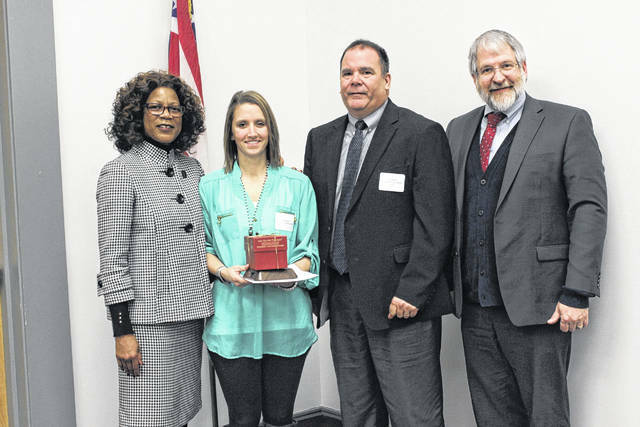 https://www.mydailysentinel.com/wp-content/uploads/sites/14/2018/02/web1_Jenna_Meeks_Teacher_Award.jpgPictured second from left, CORAS winner Jenna Meeks, along with Southern Local Superintendent Tony Deem, Superintendent of Public Instruction Paola DeMaria and Dean of Education at Ohio University Dr. Renee Middleton.